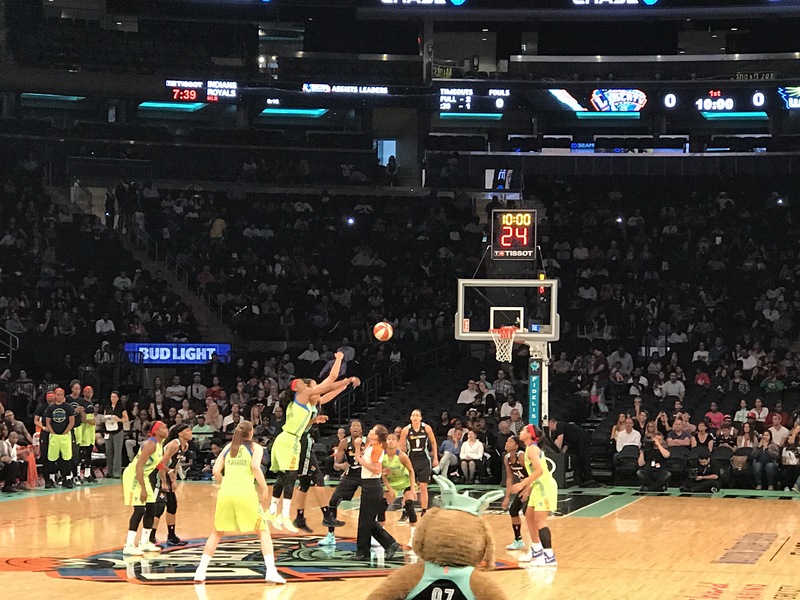 After a tough loss against the LA Sparks the Liberty needed a win. Inconsistent play to begin the season has the team caught in the middle of the pack in the standings. A “roller-coaster ride” is how I described their season after their last game at home. They are currently in a stretch of five games where they play at home before going on the road. These games are very important as the team looks to improve their record. Against the Dallas Wings they began their first of 6 games without Kia Vaughn and Epiphanny Prince who will not be with the team due to their obligations to their overseas teams. They needed someone to step up and a few players did. Lindsay Allen got her first action as a WNBA player after she resigned to the team. Coach Laimbeer stated that it was very tough to cut her at the end of training camp but he told her that she was a WNBA player and she would get her opportunity in the league. Because of the injury to Brittany Boyd and the absence of Vaughn and Prince Allen got her chance to prove herself. “She was thrown into the fire after two practices.” – Coach Laimbeer on Lindsay Allen’s first WNBA game. Bria Hartley got the start at the point guard position. She played very well early on she hit two big 3’s in the opening quarter and played some solid defense on Dallas’ Skylar Diggins-Smith. Hartley finished the game with 10-points and 4 assists and she showcased her versatility on both ends of the floor. Shavonte Zellous had a big night for the home team, 27-points, 8 rebounds and 3 assists. Zellous was aggressive offensively and her big night complimented Tina’s big night as well. When the Liberty needed big buckets Shavonte was there to provide an answer. She had to perform at various positions as she played some minutes at the one and at the two guard spot. She was up for the challenge. Shavonte’s energy and emotions were high and it poured out on the floor as she was very engaged on both ends. “I knew I had to be aggressive with two key pieces missing…” – Shavonte Zellous. Kiah Stokes after struggling mightily to begin the season had a breakout game. A well needed double double and a performance that showed the potential that she had at the end of last season. Coach Laimbeer stated previously that he was on Kiah to improve her conditioning and confidence out on the floor. She finished with 13-points and 15 rebounds which was surely a confidence booster for her, her teammates and her coaches. Bill Laimbeer spoke about how the rest of the team and especially Tina Charles remained confident in Kiah and encouraged her in practice as she was going through this difficult stretch. Tina Charles was magnificent against the Wings. She finished the night with a new career high of 36-points. She added 10 rebounds and 3 assists as she willed her team to this very much needed victory. The team had been up and down so far and Tina as one of the leaders needed to get the team back on track. The Wings were led by Skylar Diggins-Smith with 19-points and 3 assists however rookie guard Allisha Gray once again showed that she will be a very solid WNBA in the very near future she had 15-points, 4 rebounds and 3 assists. The Liberty will face the Phoenix Mercury Sunday at the garden as they look to get a second win against them this season.